Jim Onley logged more than a million miles behind the wheel during his more than three-decade career as a truck driver, but a letter delivered to his New Milford, Ill., home in April stopped him in his tracks. The letter said his $2,100-a-month pension will be gone by 2025 and maybe sooner. Onley retired in 2002 when his employer, Consolidated Freightways, went bankrupt and closed its doors. The company was a member of the Central States Pension Fund, the nation’s fourth largest multiemployer pension fund, which told its nearly 400,000 pensioners in April that it will run out of cash by 2025, and possibly sooner. There are more than 1,000 multiemployer pension funds in the U.S., and about 100 of them — of which Central States is the largest — are projected to run out of money within 20 years. 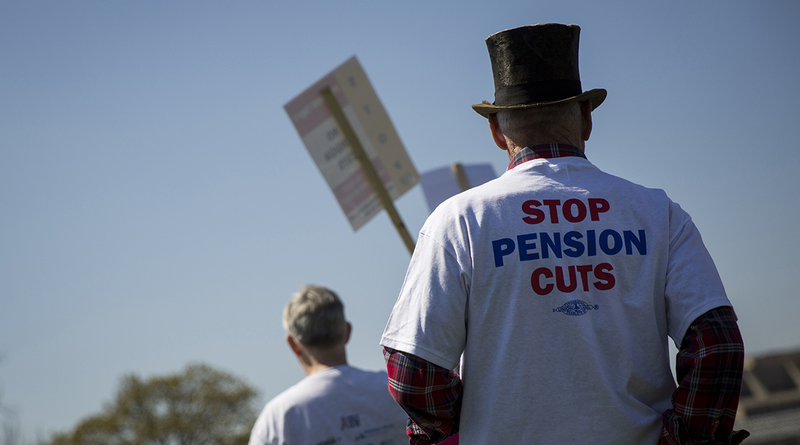 The magnitude of these failing private sector pensions is far smaller than the looming catastrophes facing thousands of underfunded local and state government pensions across the country. Nevertheless, if all endangered multiemployer pension funds were to go under, some 1.2 million active and retired workers in the U.S. would be left with a fraction of the pension benefits they were promised. In many cases, endangered multiemployer pension funds haven’t fully recovered from downturns in financial markets during the last decade. Another reason the funds are collapsing: Many companies that used to pay into the pension funds have either left or gone out of business, such as Consolidated Freightways, the company Onley once worked for. Trucking companies and factory workers — two industries that have shrunk considerably in recent decades — have traditionally made up the bulk of Central States members. Economic pain would ripple through Rockford and other northern Illinois communities if Central States were to fail. Collectively, there are more than 5,800 Central States participants who live in Congressional districts represented by Cheri Bustos, (D-Moline), and Adam Kinzinger, (R-Channahon), according to the pension fund. Central States pays more than $20.5 million a year in benefits to retirees who live in Bustos’ district and $25.4 million a year to those living in Kinzinger’s district. “If those pensions fail, the economic impact in the Rockford area and nationwide would be just devastating,” said Eric Calvert, secretary and treasurer of Teamsters Local 325 in Rockford. Calvert estimates that 80% of the local’s 1,300 members in the Rockford area are affected by the looming collapse of Central States. He’s urging his members who are affected to contact their representatives in Congress and demand a solution to the problem. A bipartisan 16-member Congressional committee is tasked with crafting legislation by the end of November to do just that. If Central States were to fail, it would spell doom for more than just its 397,492 participants. Experts say a Central States collapse could push several national trucking companies into bankruptcy because they’d be responsible for making up some of the fund’s liability. UPS, which employs more than 2,000 people at its Rockford Air Hub, could be on the hook for $4 billion in pension payments if Central States were to fail. UPS ranks No. 1 on the Transport Topics Top 100 list of the largest North American for-hire carriers. That’s not all. A Central States collapse would also push the government’s pension insurance program into insolvency sooner than projected. The Pension Benefit Guaranty Corporation multiemployer program funnels cash to pensions that run out of money so they can pay benefits to retired workers. The program is expected to run out of money within 10 years. It’s not yet clear what type of solution Congress will settle on. Possibilities include raising employer contributions, reducing pension benefits or some form of what amounts to a government bailout of the Pension Benefit Guaranty Corporation so it can prop up failing pensions. UPS and the International Brotherhood of Teamsters have pitched similar proposals that would effectively have the federal government sell bonds and use the proceeds to provide low-interest loans to failing multiemployer pension plans. Pension funds would be required to invest the proceeds into safe investments such as annuities, and the money would be repaid within 30 years. Bustos is among Democratic leaders in Congress who endorsed this concept last fall as a means to prevent any cuts to retirees’ benefits. Members of failing multiemployer plans “did the right thing every step along the way, but they’ve gotten a raw deal,” Bustos said when Democrats unveiled their plan in November. Democrats acknowledge, however, that the loans wouldn’t be enough to cover shortfalls of all failing multiemployer plans and that Congress would need to appropriate more money to bolster the Pension Benefit Guaranty Corporation. That would be cheaper, they say, than reviving the pension insurance program should it fail — a scenario that the Congressional Budget Office estimates would cost $101 billion over 20 years. Active and retired employees in many multiemployer pension plans have already been subject to benefit cuts over the past decade, Aubry said, and many employers have scaled up their contributions, too. Onley said the pain shouldn’t fall entirely on the shoulders of retirees.